Options Straddle - What Does It Mean? 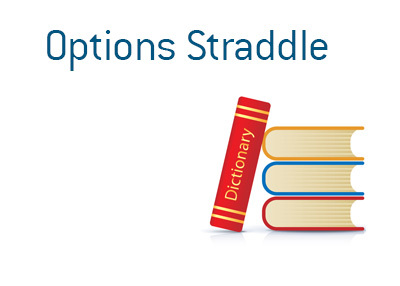 What does the term "options straddle" mean in the world of trading? What is the definition of the term "options straddle"? In the world of trading, an "options straddle" is when you purchase a put AND a call of the same underlying stock at the same strike price and same expiration date. The "straddle" is a neutral strategy in which you are expecting a big move in either direction. With the "straddle", you don't care which way a stock moves - as long as it moves. Let's look at an example of a "straddle". A biotech stock that we'll call XYZ, Inc. (trades under the symbol XYZ) has an important decision coming up with the FDA. The stock is currently trading at $30 per share. Analysts believe that a favorable FDA decision could propel the stock to $90/share overnight, while an unfavorable decision could absolutely decimate the stock. You decide that you are going to put on a "straddle" on XYZ in order to take advantage of this potential volatility. Due to the high implied volatility, the call and put both cost you $6.00/option. This means that the stock will need to have moved $12/share in either direction by expiration in order for you to make money. If the FDA decision is delayed, for instance, you will suffer from "volatility crush" and your options will both decline significantly in value. If you are going to put on a straddle, you need to make sure that the event that you are expecting will take place will actually happen when the company thinks it will.